I travel quite a bit for my job. Honestly, long hours in airports and hotels weigh on me, as do the rigors of the conference room and the speaker’s lectern. Sigh. Salvation lies in city streets, where I go hounding for good, relatively inexpensivce chow. In no particular order, here are my most memorable road meals of 2011. It’s really just another strip mall amid a galaxy of them in L.A. It offers a laundromat, a Thai massage parlor, a discount store, a burger joint, a “nail spa,” … and what might be the greatest wine bar in America. OK, so not every strip mall in L.A. has a Lou Wine Bar. But they should! Lou delivers what you want from a wine bar: low lighting, zero pretension among the waitstaff, the murmur of animated conversation, “small plates” containing big flavors, and, most importantly, a terrific list of off-the-beaten-path bottles. Lou is a temple of what has become known as “natural wine”—wine made without the homogenizing manipulations of industrial technology (here’s the house manifesto). Both the menu and the wine list change frequently. The food savors of the Santa Monica farmers market; and the wines offer flavors as idiosyncratic and welcome as a great bar in a nondescript strip mall. I remember well a particularly gruelling day in L.A. last February; Lou made it all better that night with a glass of Cabernet Franc from France’s hallowed Loire Valley and a plate of wicked-fresh arugula with glorious cheese and charcuterie. I have but six words for this intimate, farm-focused restaurant tucked into the East Village: lamb burger with duck-fat fries. Order it next time you’re skulking around Manhattan at lunchtime and feeling dented. Or go for the raw-kale salad featuring a market basket’s worth of veggies and a couple of baked eggs. Either will set you right—as will will the terrific list of regional brews. Right up my alley. e is also terrific, as is, come to think of it, everything else I’ve tried. Bonus: Right outside of Green Table in Chelsea Market, there’s an outpost of 9th Street Espresso, one of the city’s shrines to great coffee. In New Orleans, it’s no secret that people sometimes get stuck in a bar and end up having too many Sazeracs. Not that I have any such first-hand experience! But I do know where to go the morning after. 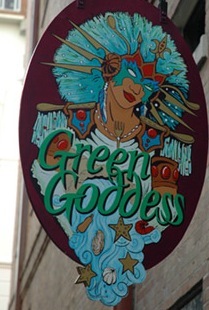 Step gingerly through the French Quarter and find the quiet alley graced by Green Goddess. When I did so, they sat my friends and I at an outdoor table and poured us cups of coffee so strong we had to nurse them through an entire leisurely brunch (not our standard practice). Then they started bringing out amazing and even radical food. First up: sliced heirloom tomatoes topped with a mat of molten manchego cheese and then caramelized sugar: a bizarre and scrumptious spin on crème brûlée. Then French toast, stuffed with sauteed apples and finished exactly the same way as the tomatoes. All to myself, I had the ultimate hangover platter (strictly for research purposes): two fried eggs with strips of fried pork belly, all sitting on a bed of collards. And my friend had the greatest Cuban sandwich I’ve ever had a bite of. All the while, the gentle autumn sun of the greatest US city fell upon us, and all was well.